I just got a product alert email with all the new swim line but sadly all of the actual suits are dead links so I can’t get rear view pictures for you just yet, or links to them on the website. Lame-o! Oh well, I’m sure we will see them all tonight. Ok, first impression for me is that I’m kind of liking some of these. I like the black and navy together, and I love the Real Green. 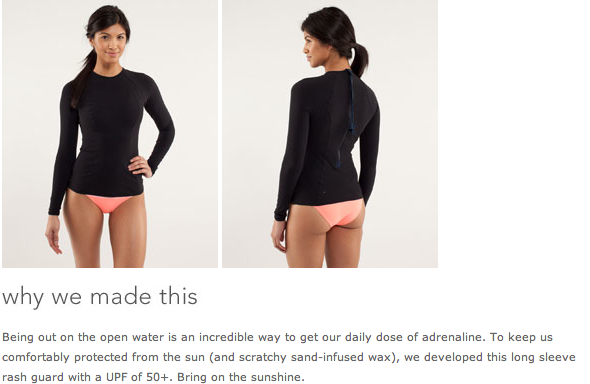 They probably do not meet the modesty requirements my 32 year old body would prefer, but I do like the Coastal Om Triangle Top and the Board Balance Sport Top, and the Sandy Savasana Bottoms. Are we missing swim shorts this year? The Coastal Om Onesie may be cute too. If these are final sale, as much as I may like them online I wont be ordering them online. I just can’t chance a bad fit so I’ll be checking these out in store.